Hypnopazūzu - David Tibet (Current 93) & Youth (Killing Joke) - first concert in Germany. The Vision Bleak - special performance with a classical ensemble of strings, percussion and vocals. Dornenreich - exclusive acoustic history set. Dool - exclusive set with additional musicians and singers. Hexvessel - extended performance with implemented acoustic set. Spiritual Front - special "Armageddon Gigolo" set for Prophecy Fest 2017! Sun Of The Sleepless - Schwadorf's (Empyrium/The Vision Bleak) first concert since 1999, second ever. The Moon And The Nightspirit - special show with enhanced line-up. Lotus Thief - European premiere. Soror Dolorosa - performing "Severance" in its entirety for the first time & presenting their the new album "Apollo". GlerAkur - the band surprised us and blew us away with their performance at Prophecy Fest 2016. It was an easy decision for us to invite them again. 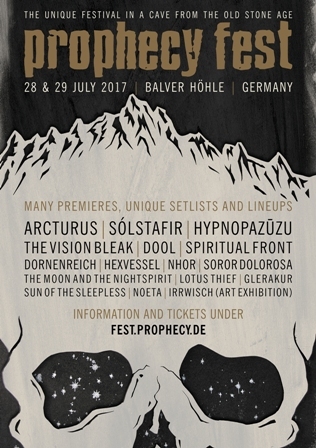 NOÊTA - their first concert outside Scandinavia at this year's Prophecy Fest! Irrwisch - art director and exhibition.